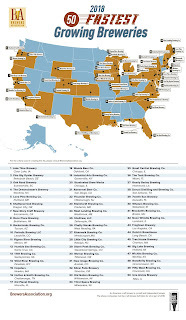 The Brewers Association released its second annual list of the 50 fastest growing small and independent craft brewing companies of 2018. 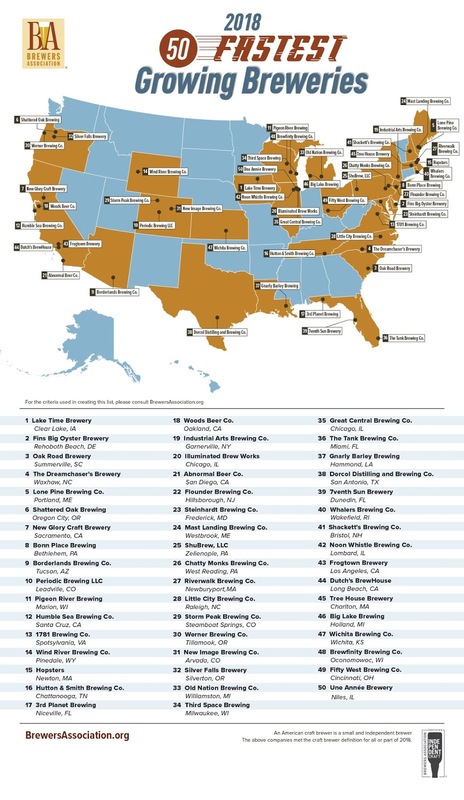 "These small and independent craft breweries from 27 states registered a median growth of 163 percent in 2018 and included 13 brewpubs, 35 microbreweries, and two regional craft breweries". "Even as market competition continues to increase, these small and independent breweries and brewpubs demonstrate there are still growth opportunities across a diverse set of regions and business models," said Bart Watson, chief economist, Brewers Association. And the list is rather representative of all geographic regions. Methodology: The list presented includes only small and independent breweries. Growth is measured based on production at their own facilities. Breweries must have opened by December 31, 2016, or earlier to be considered. It only includes breweries that reported 2018 production to the Brewers Association’s annual Beer Industry Production Survey; breweries with staff estimates or data from state excise tax reports were not considered. Breweries also needed a validated production figure for 2017, either via the production survey, or state excise tax data.